When Efraín Rivera-Serrano looks into his microscope he sees a world of color, miniature masterpieces of swirling and sweeping electric blues, greens and magentas. Technically, he’s looking at viruses impacting the cells of the heart. But using technique called fluorescence microscopy, the North Carolina State University College of Veterinary Medicine (CVM) student transforms the basic building blocks of life into something eerily beautiful. It’s also something that’s innovative and impactful. Working in the lab of Barbara Sherry, a CVM professor of virology, and using mice as models, Rivera-Serrano studies how the heart’s cells react to viral infections. 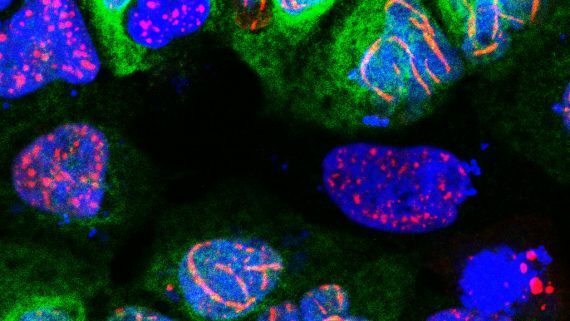 He assigns colors to parts of cells — blue for the nucleus, magenta for the cytoskeleton, red for mitochondria — and then a different color to a virus. What emerges is an exquisitely detailed picture of what exactly happens when viruses attack the heart, leading to such conditions as irregular heartbeat, tissue damage and even heart failure. 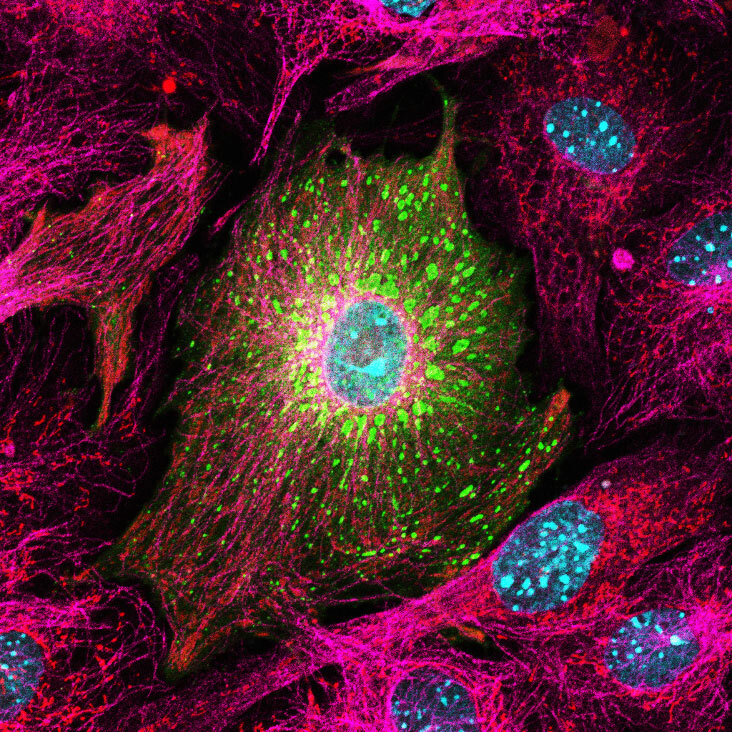 Rivera-Serrano assigns colors to parts of cells — blue for the nucleus, magenta for the cytoskeleton, red for mitochondria — and then a different color to a virus. Rivera-Serrano documents these “battlegrounds,” as he calls it; he’s an eyewitness to the tug of war that unfolds when a virus enters a cell. 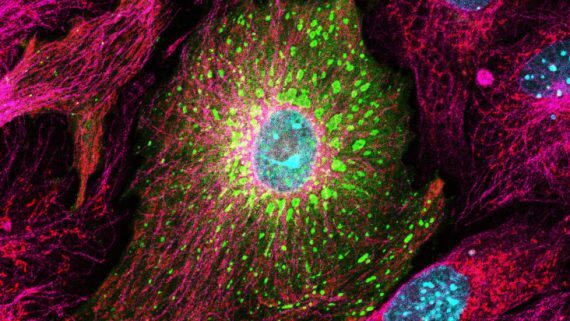 With fluorescence microscopy, he is able to not only see inside of the cell but provide particular insight into how the virus manipulates the cell’s host. 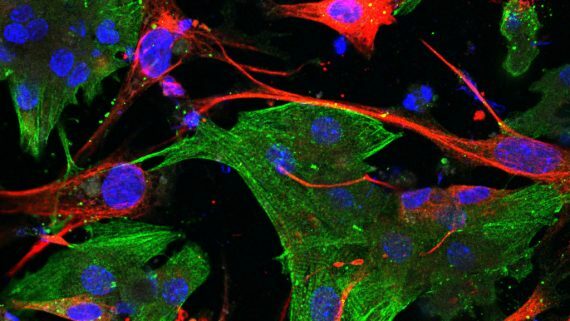 The work sheds light on the unique behavior of cardiac cells and could lead to more effective, targeted treatments. That information has the potential to be applied other organs in the body that are particularly susceptible to infections. The research in Sherry’s lab is primarily funded by the National Institutes of Health. On Friday, when Rivera-Serrano earns a Ph.D. in comparative biomedical sciences with a concentration in infectious diseases, it will mark the end of a nearly 10-year academic journey at NC State. Born and raised in the coastal city of Ponce, Puerto Rico, Rivera-Serrano is the only child of a stay-at-home mother and now-retired police officer father. A nature lover from a young age, Rivera-Serrano has long reveled in photographing flowers and plants. 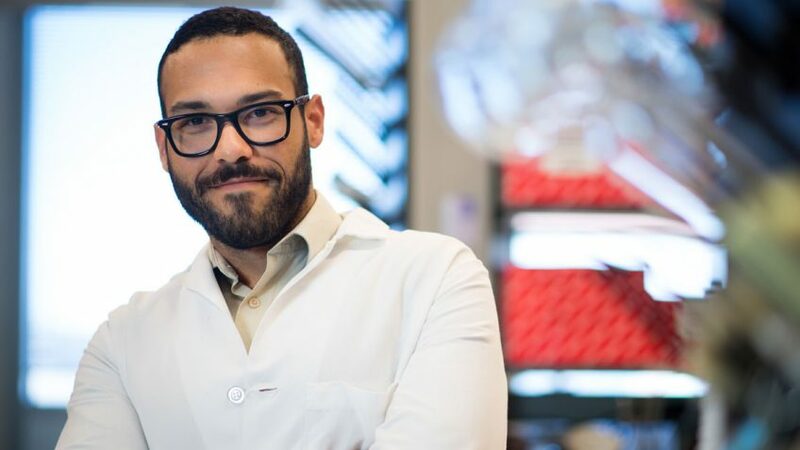 It wasn’t until he took a biology course at the Pontifical Catholic University of Puerto Rico that he found his calling behind a microscope. He quickly went from a broad general sciences focus to concentrations in biology and chemistry. 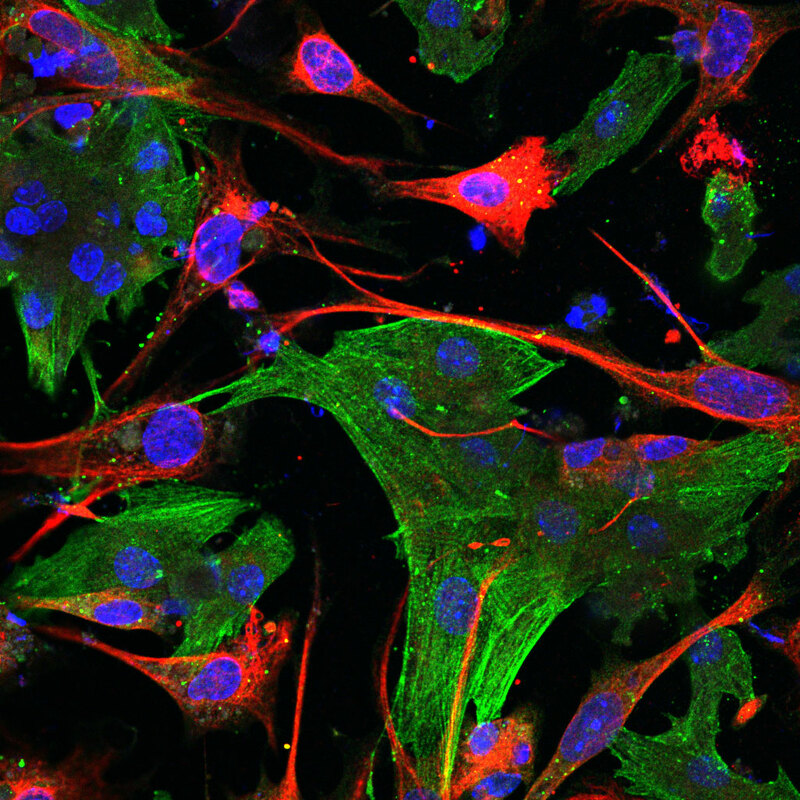 A culture of cardiac muscle cells (green) and cardiac fibroblasts (red). He was exploring the world of microbiology, studying the basics like bacteria development, in a small lab in Puerto Rico when he was recruited by NC State for a summer internship and began learning English. When he returned to Puerto Rico, he decided to ditch microbiology to focus on his longstanding passion for plants. In 2009, a week after he graduated college, he started a master’s program at NC State in plant cell biology with a minor in biotechnology. Then came the pull of a Ph.D. program at the CVM — and another academic leap of faith after securing a spot in Sherry’s lab. So, after earning his master’s, he unhesitantly dove into something new again. He took courses in virology and immunology. He had been trained in the specialized microscopy in his master’s adviser’s lab and now he would be using it for the stream of work coming out of Sherry’s lab. 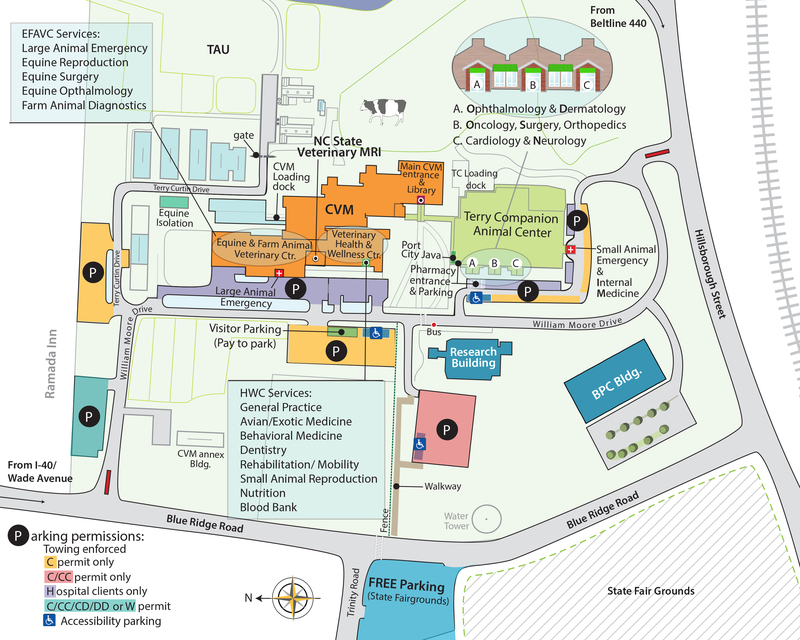 Rivera-Serrano has left a mark at NC State and the CVM in other ways as well. He has co-authored numerous studies and won awards for his posters, research and microscopy photography. He has helped trained undergraduates and traveled to high schools in the state to promote science. 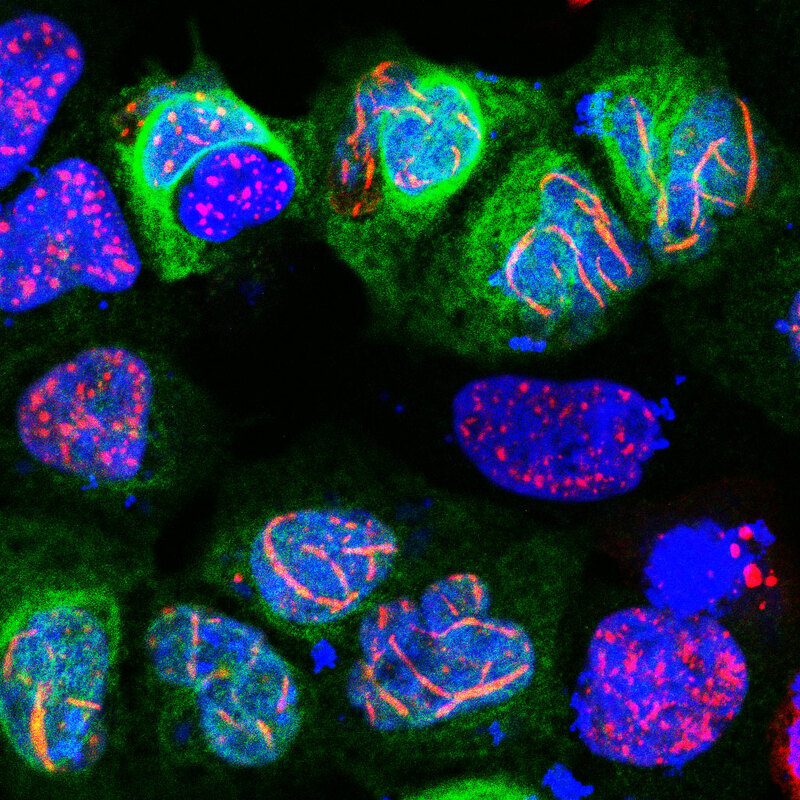 Multiple cells expressing a viral protein (green) that alters the localization of a cellular protein (red) inside the nucleus (blue). Along the way, he found his scientific niche. He said he will always regard NC State has the place that both encouraged and cultivated his interests. “I don’t think any other university or another group of people would have been such advocates for me, especially when I transitioned into the Ph.D. program,” says Rivera-Serrano. “I don’t think I would have gotten any of that support anywhere else. Rivera-Serrano has more questions he wants to answer. In a few months, he’ll begin post-doctoral research in a lab at UNC-Chapel Hill, still using fluorescence microscopy imaging but this time studying how viruses infect the liver. He is preparing to leave Raleigh — a city he fell quickly in love with — to move into a house in Hillsborough closer to the UNC with room for his seven dogs. Another change: Friday will be the first time Rivera-Serrano has attended one of his graduations. He skipped his high school, undergraduate and master’s ceremonies. This time is a little different. Right now, after his years at NC State and his two advanced degrees, he says he finally feels academically fulfilled. So he’ll walk for the first time — and his mom will be here to see it all. But he’s not really done. Rivera-Serrano’s eye will never be far from a microscope. It’s tough to look away when what’s on the other end is so breathtaking.